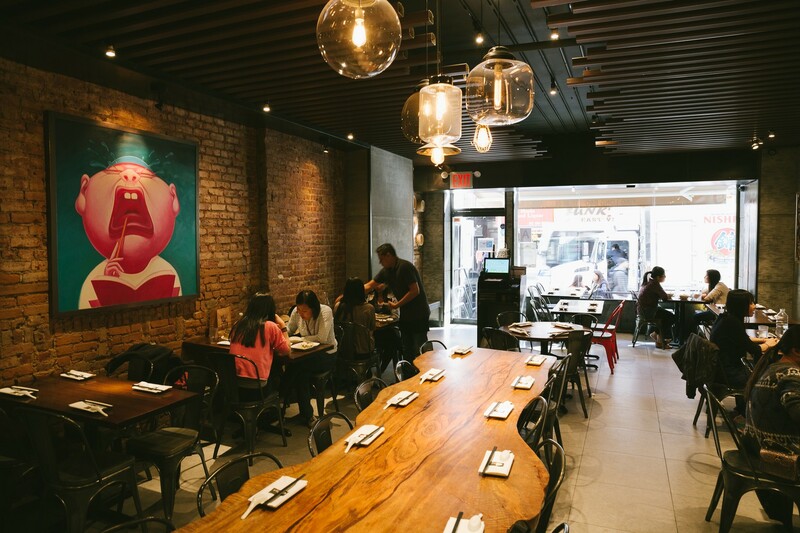 The first thing you notice when you walk into The Bao is what we recently learned is called a “live edge” wood table. It’s when the sides of the table are kept wavy, so it looks like an actual tree rather than a perfect rectangle. The main reason to have one of these tables is to give people the impression that you get your furniture from artisans in Vermont who make things out of salvaged wood. The Bao has a huge live edge wood table running through the middle of the restaurant, which makes it stand out for a few reasons and also says a lot about the place. For one, The Bao is on St. Marks, situated among the host of bong shops that seem to specialize in those smoking accessories that look like bottles of Sierra Mist. Second, The Bao is known for having some of the city’s best soup dumplings. If you’ve made the soup dumpling rounds, you’re used to places like Joe’s Shanghai, where the most notable elements of style are the ceiling tiles like those in your 8th grade science classroom or Midtown office cubicle. All of this is to say The Bao is a little different, and so are its soup dumplings, which are the primary reason to pay a visit. They’re much more delicate than what you’d find at Joe’s or other Chinatown faves, with a thinner skin and a lighter, less oily soup. They also come in a variety of flavors - in addition to the usual pork and crab meat, there’s a super spicy version and a wasabi version. In other words, they’re like the table - just a little bit fancy. We also happen to think they’re incredibly good. These soup dumplings are now our favorite in the city, or at least in Manhattan, but the rest of the menu is worth trying, too. It’s full of classed up Chinese classics, so plan to get down with some pan-fried noodles that will make you wonder how you ever thought takeout lo mein was good at all. Next thing you know, you’re going to find yourself browsing for artisan tables on Etsy. The main draw, and there are a few varieties to choose from. Our favorites are the pork and the wasabi, which adds a touch of wasabi to a pork dumpling. There’s a “super spicy” version, where “super” is an appropriate adjective, and you kind of have to be a masochist to enjoy them. If you’re really going nuts, a chocolate-filled dessert bao is also available. Turns out that even the dumplings without soup inside are pretty great here. Get an order of these. They may not beHan Dynasty, but these dan dan noodles - topped with chili oil and minced pork - are worth getting on your table. Not really sure what they do to make these noodles taste way better than any other lo mein-type noodle, but it works. Order them. Should you feel the need for some vegetables, try this mash of eggplant and peppers.